Jean-Louis: My Christianity and my love affairs are different, even conflicting matters. Vidal: Yet they coexist in the same person. Jean-Louis: It's a rather stormy coexistence. Born Jean-Marie Maurice Scherer, Eric Rohmer is a unique voice in cinema, one which tends to polarize its audience with his quiet, dialogue-driven exposés of the human psyche, and certainly, in Les Contes moreaux (or, Moral Tales), he defines the character study. Like many of his contemporaries in the French nouvelle vague�Truffaut, Chabrol, Rivette, Godard�Rohmer first spent time as a critic, founding the prestigious Cahiers du Cinema during the 1950s and early 1960s, working as its editor-in-chief. After failing to gain critical success with his first feature, Le Signe du lion (The Sign of Leo), Rohmer teamed up with future director Barbet Schroeder to form the production company Les Films du Losange to begin production over the following decade of the first of his filmic cycles, the Moral Tales, which were first developed as short stories during the director's time at Cahiers du Cinema, with the intent of transitioning them to the cinema. Each of the stories finds a man, already committed in some fashion to one woman, finding diversion in another. The common thread throughout the Moral Tales is not the events that are taking place�plot is of little consequence�but the inner workings of the characters, their thought processes and justifications for their behavior. Each faces a dilemma based on their own moral code, and the rationalization behind the ultimate outcome is where the magic of this collection lies. This process, and the character's reaction to their circumstance, exposed through dialogue or voiceover, is what carries the films. Rohmer's gift is in articulating the often conflicting ideals that his characters, and indeed all human beings face. Critics note his slow pacing, abundance of dialogue and limited action, but these are necessary in order to immerse the viewer in the emotional and psychological state of his subjects. Although the cast is often made up of amateurs, Rohmer manages, through his precise scripting and direction, to give each of his characters an authenticity, and his attention to detail permeates the productions, from locations to timing his shooting schedule to coincide with actual events, no matter how seemingly trivial. The conversations that make up the majority of any Rohmer film establish the underlying personality and moral base that comes into conflict. Each of the tales is a variation on a theme, which as a whole creates a rich and satisfying viewing experience. The first of Rohmer's tales finds Barbet Schroeder as a young law student infatuated with Sylvie (Mich�le Girardon), a girl he sees on the street each day but is too shy to approach. After agonizing over how to introduce himself they finally meet by accident, and she agrees to make arrangements for a get-together when they next see each other, but then abruptly disappears, leaving the young man to forego his diners to search the streets of Paris in an vain attempt to find her. As part of his daily ritual, he begins to frequent a local bakery, where a young girl (Claudine Soubrier as Jacqueline) takes notice of him. In response to the rejection he feels from Sylvie's unexplained absence, he decides to pursue this new interest out of spite, knowing she is unsuitably beneath him. Filled with images of 1960s Paris, The Bakery Girl of Monceau introduces us to the familiar theme throughout the Moral Tales, where the protagonist must make a decision based on his conscience, even if his actions are justified only through his own skewed interpretation. Much of the exposition is done in voiceover, provided by Bertrand Tavernier. The second Moral Tale centers around Suzanne (Catherine S�e), a naïve young girl who becomes involved with a pair of fellow university students, Bertrand (Philippe Beuzen) and Guillaume (Christian Charri�re). The two men conspire to toy with her affections, with the brash and insensitive Guillaume winning her favors. As their ploy to exploit Suzanne unfolds, they unapologetically goad her into financing their entertainment before eventually dumping her, but Bertrand's conscience is put to the test when Suzanne returns and confides that she is broke and now without a job, largely due to her generosity. With Suzanne's Career, Rohmer explores the fidelity of friendship, the willingness to be exploited, and ultimately the reward for honesty. Bertrand's dilemma balances his allegiance to a friend he knows has few scruples, with the feelings of the woman he has helped destroy. When a pivotal discovery is made, Bertrand's conclusions are based more on his desire of the truth than the facts, and his perspective, in need of re-evaluation, finds its opportunity in the end. My Night at Maud's finds a devout Catholic engineer facing a test of his moral integrity. While attending mass during the Christmas season, Jean-Louis (Jean-Louis Trintignant) finds himself enamoured with a stranger who, although they have never met, he believes will become his wife. When an old friend (Antoine Vitez) whom he hasn't seen in years invites him to the home of Maud (Fran�oise Fabian), an attractive divorc�e, his scruples are put to the test when he ends up staying the night. A central theme in My Night at Maud's is that of probability, which raises debate during the film over the writings of 17th-century French mathematician and religious philosopher Blaise Pascal, who hailed from the area of Clermont-Ferrand where the film takes place. Through his arguments, Jean-Louis represents his moral character only to discover that the fortitude he has expressed may not hold up in reality. Even though the fourth installment, La Collectionneuse, had already been released by the time My Night at Maud's was filmed, Rohmer returned to the black-and-white format as per his original design for the series, and N�stor Almendros' photography captures the mood of the film impeccably. It is interesting to note that this, arguably the most celebrated of the Moral Tales, was one of the hardest to get financed, which delayed its production for years. It was Fran�ois Truffaut who assisted in getting the film off the ground by encouraging a collaborative parnership to fund the film. Considering its extensive and often philosophical dialogue, it is somewhat surprising that it would receive much critical acclaim, but it received two Oscar nominations including Best Foreign Language Film. La Collectionneuse (The Collector) would be the third of the Tales to be filmed, and Rohmer's first foray into color, while also his first feature to be shot by cinematographer N�stor Almendros, who had previously worked on the short, Nadja � Paris and some of Rohmer's television work. Set in and around a 16th-century villa on the French Riviera, the film would be a departure in terms of its writing, which this time was a collaboration with the actors, whose personalities Rohmer found particularly interesting. Shot on a miniscule budget, the film consists almost entirely of first takes. Patrick Bauchau stars as Adrien, a parasitic art dealer who decides to pursue funding for a gallery while on retreat as a guest of a friend in absentia. His desire is to immerse himself in total isolation, but while content to tolerate the presence of his companion, Daniel (Daniel Pommereulle), an artist, and another guest, the young and promiscuous Haydée (Hayd�e Politoff), is cause for upset. Despite her attractiveness, both men agree that they will forego seducing her, noting her collection of boyfriends and bohemian behaviour. This situation isn't long to last, and soon Adrien is urging his friend to sleep with her, if only to spare himself the risk of becoming involved. However, this tactic soon shows its flaws as Adrien is increasingly drawn to Haydée. It would be hard to tell from the final product the constraints (which are detailed in the interviews supplementing this release) under which it was made. Visually, this is a simply gorgeous film, with Almendros capturing a remarkable warmth in his photography and compositions. Apart from a few specific scenes, the acting has a very relaxed and natural feel, which adds to the atmosphere. The personalities are intriguing�Adrien for his snobbishness, Daniel for his more flamboyant qualities, and the alluring Haydée for her philosophy of "collecting experiences." In Claire's Knee, the soon-to-be wed Jerome Montcharvin (Jean-Claude Brialy) returns to Lake Annecy to sell the family home and meets Aurora (Aurora Cornu), an old friend and novelist looking for inspiration for her new book. Aurora is staying at the home of the Walter family, whose sixteen-year-old daughter Laura (B�atrice Romand) confesses a crush on Jerome. Despite his engagement and insistence that he has no desire for anyone but his fianc�e, Aurora persuades Jerome to encourage the girl, with the intent of exposing the developments in their relationship for the subject of her new story. Jerome plays along, but when Laura's older sister, Claire (Laurence de Monaghan), arrives on vacation, his attention is diverted, drawn principally by the allure of the girl's knee, her indifference to him adding to her desireability. Here again the moral dilemma unfolds�aside from already being committed to marriage, both of these girls are far too young for Jerome, yet both offer an opportunity for adventure, even if it is only to toy with their emotions. The internal struggle as Jerome carries out the plot he and Aurora have concocted creates an interesting portrait of a man who is at once self-assured, yet compelled by his attraction to these young women. The performances here are wonderful. Brialy does a fine job expressing the outward confidence, yet inner awkwardness of his character, while Cornu aids in directing her subject in his manipulations. Romand is outstanding as the innocent, open, and honest Laura, herself somewhat a loner detached from the world of her contemporaries, seeking the reward of an ideal romance. By contrast, the very attractive de Monaghan plays her disinterested Claire to perfection, while facing deception from both of the men in her life. The story is presented in a diarized format, chaptered by the date, and rather than narrative, here Rohmer uses the conversations between Jerome and Aurora to reveal his thinking. The direction is flawless, and Almendros' beautiful yet simple compositions capture the ambience of the vacation retreat superbly. The final installment, known as Chloe in the Afternoon in its US release, finds a happily married business executive tempted by a woman from his past. Although he entertains fantasies about the women he meets throughout each day, Fr�d�ric (Bernard Verley) has been a faithful husband, finding married life has helped him appreciate the beauty that surrounds him. His wife H�l�ne (Fran�oise Verley), now carrying their second child, works studiously on her thesis or on grading papers while he reads each evening. One day at the office, Chlo� (Zouzou) appears, a woman who had lived with a friend of his a long time ago. There had been a great deal of animosity back then, but her return brings mixed feelings. They begin to see each other on a regular, but strictly platonic basis, and Fran�ois soon discovers he enjoys a freedom in his discussions with Chlo� that he doesn't have with his wife. Chlo�'s undemanding acceptance of her role on the side would seem to be appealing to a man who has already expressed his desire to relive the excitement of the swinging single, but the question is whether he will be able to live with the consequences of his actions should he continue down the path he finds himself on. Where others may have rushed to the seemingly inevitable act of infidelity, the beauty in this work is the protraction of the relationship, as Chlo� transforms from the tomboy who first appears at the office into a more refined Parisienne, upping the ante with each encounter, until the decisive moment arrives. The prologue illustrating Fran�ois' imaginings is one of the rare instances of surrealism to be found in Rohmer's work, as he interacts with a parade of characters from the previous films, providing a bookend to the series. Image Transfer Review: There is simply no comparison to be made between these transfers and those previously available on DVD. For those who believed these films would forever look dingy, washed out, riddled with print defects, you are in for a very pleasant surprise. With these director-approved transfers, Criterion has finally given Rohmer's work the attention it deserves. The black-and-white image is nicely contrasted. Shot on 16mm, both are soft by comparison and exhibit a fair amount of grain structure, but defects are all but nonexistant, except for a few brief scratches here and there, although splice marks are visible on the majority of cuts in the latter. The quality improves with a move to 35mm, as the image here is smooth and rich in detail, with a fine, natural grain. Tonal balance is pretty much perfect, with good shadow detail and silky midtones. All three color films look wonderful, with nicely saturated colors and solid black levels. The color in La Collectionneuse is wonderfully rich and earthy, detailed without being overly sharp. Claire's Knee is slightly softer, with a little less detail present in select shots, while Love in the Afternoon is solid thoughout. Apart from a couple of minor jump frames, there are no print defects to speak of. Audio Transfer Review: All six films are presented with their original French mono soundtracks. Audio quality is very good throughout, with the earliest films having more background hiss in places. Dialogue is reasonably clear, although somewhat sibilant. There is little to complain about here. Extras Review: Fans should be thrilled with the wealth of supplements found in this set, which do a superb job of illuminating the many talents of this exquisite filmmaker. Not only has Criterion managed to assemble a collection of short films and interview segments detailed below, but the set also includes two printed supplements. The first collects the six original short stories in a 262-page book. 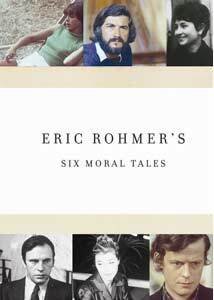 The second is a 56-page collection of articles and essays covering the Six Moral Tales, along with Rohmer's 1948 article, For a Talking Cinema and excerpts from cinematographer, Nestor Alamendros' autobiography discussing La Collectionneuse. The packaging is tasteful, similar in style to Criterion's previous Adventures of Antoine Doinel set. Each disc is housed in its own digipak case containing chapter (7-15 per film) and extras listings. My only minor complaint is that the surrounding box is slightly too large for its contents, which makes it easily susceptable to shipping damage. While trivial in the grand scheme of things, especially considering the care give to its content, the front panel images could have been more carefully chosen so that the new Criterion logo was not obscuring a main character's face. As for the on-disc extras, there is a lot to chose from. The first disc includes Rohmer's 1951 (9m:53s) short film, Presentation, or Charlotte and Her Steak (Pr�sentation ou Charlotte et son steak), a novel piece starring Jean-Luc Godard as a young man attempting to win the affections of a young woman over an unorthodox dinner. Also included is Moral Tales, Filmic Issues a new (1h:24m:03s) interview featuring Rohmer and Barbet Schroeder, which features an engaging conversation covering their history together and their collaboration on this project. A wide range of topics is covered, from the conception of the series to Rohmer's philosophies on shooting and sound. The second disc contains the 1964 short Nadja in Paris (13m:10s), shot by Nestor Almendros and featuring Nadja Tesich, an American student at Cit� Universit�, as she gives viewers a tour of the city, providing a snapshot of mid 1960s Parisian life. The third disc features On Pascal, a Rohmer directed segment from the 1965 educational television series En profil dans le texte in which the writings of French philosopher Blaise Pascal (whose work forms a central theme in My Night at Maud's) are debated. An excerpt (13m:38s) from a 1974 episode of T�l�cin�ma features interviews with My Night at Maud's star Jean-Louis Trintignant, producer Pierre Cottrell and film critic Jean Douchet. On the fourth disc we find Rohmer's 1966 short, A Modern Coed (12m:48s), which contrasts the then contemporary academic woman with those of the past, as well as the changing face of academia and Parisian culture. Another fascinating interview can be found in a 1977 episode of TVOntario's Parlons cin�ma, which provides much insight into Rohmer's views on cinema, from technical aspects to the production, with a good deal of discourse on the use of dialogue. The fifth disc contains The Curve (16m:46s), a 1999 collaboration between Rohmer (credited for "découpage") and Edwidge Shakti, in which a young man draws parallels between the representation of the female form in art, and his attraction to his girlfriend, who he believes was the unknowing subject of one of his uncle's sculptures. For much of his early career, Rohmer refused to make on-camera appearances, so this excerpt from Le journal du cin�ma ( 8m:43s) attempts to paint a portrait of the artist through interviews with Claire's Knee stars Jean-Claude Brialy, B�atrice Romand and Laurence de Monaghan. The final disc in the set features Rohmer's 1958 short, V�ronique and Her Dunce (18m:22s), which finds a tutor trying to deal with a difficult student, who may be much smarter than he appears. Citing examples from the Moral Tales, writer/director Neil LaBrute describes the unique qualities in Rohmer's work that have been of influence on his own career in this afterword (11m:51s), providing yet another perspective on the man. Theatrical trailers for all but the first two films can be found on their respective discs. Eric Rohmer's brilliant first filmic cycle finally gets the treatment it deserves in this exquisite six-disc set. Magnificent transfers that finally do justice to the material, and a bounty of supplementals should delight fans and newcomers alike. With this collection, Criterion has set the presentation standard for Rohmer's work, and I can only hope that they continue to release more of the director's catalog, if this is what can be expected. This release gets my highest recommendation.